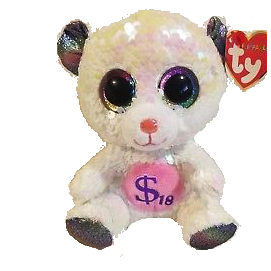 Billionaire 18 is a bear covered in flippable sequins that are a kind of white colour. He has large, glittery rainbow coloured eyes and sparkly rainbow material for the inside of his ears and his feet. He has a pink belly with $18 written on it in purple thread. Billionaire 18 was released in January 2019. He is the 18th Billionaire Bear and is part of the Ty Flippables range.